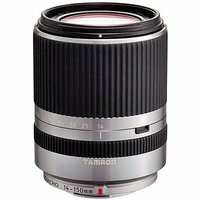 The Tamron 14-150mm f3.5-5.8 Di III lens in silver is the first Micro Four Thirds fit lens from Tamron for Panasonic and Olympus compact system camera users. Weighing just 285g, this compact, all-in-one lens offers a 10.7x zoom with a versatile focal length covering wide-angle (14mm) to telephoto (150mm) photography. Available in a sophisticated black or silver finish, this unique lens makes it easy to compose and capture sharp pictures over a very wide range of shooting conditions.